Livelys days are numbered. This is a really surprising news for today, published by the official Google blog. I am sure that the news will arose a pretty big discussion about virtual worlds. 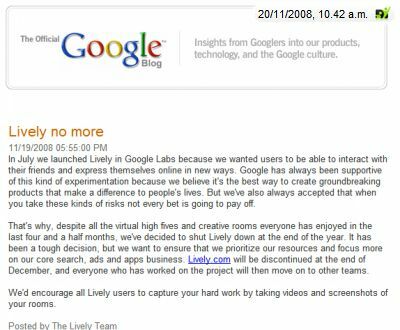 Why did Lively fail or what did Google expect from Lively? There are a lot of questions. I would like to know how many users Lively attracted and how much time the avarage user spent in world with theit 3D avatars and rooms. My personal assumption is that the users rooms were too separate and there was not enough public space to meet. Separate rooms work for social networks like cyworld and stardoll, while they are not live waiting in their rooms to be visited or if there is enough virtual space infrastructure to connect the rooms like it is in Habbo. But Lively intended to be live, so this is a different pre-condition. Lets see which reasons will be discussed in the blogosphere in the next days.